Conscious Consumption | Enuff with the Stuff – Sort Stow and Let It Go! Conscious consumption can mean different things to different people. For some, it could mean that they only buy items with little to no packaging. For others, it could mean that they only purchase items that are produced by ethical businesses and of course that judgment is up to individual interpretation. 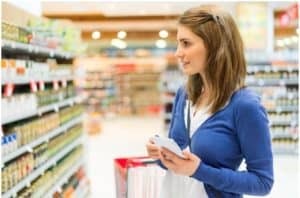 Still, others may view conscious consumption as only purchasing what is truly needed by avoiding impulse buys of products that will have a short life span due to the quality of the product; meaning, made cheaply. Our society has been brainwashed by advertising that makes everything seem like a must-have product even if you really don’t need the product. They are very clever in manipulating our thoughts and feelings so that we truly believe we need or want the product. I succumb to this powerful force too. It’s hard for me to walk by clothes, purses, shoes or jewelry and not want to own such pretty things despite the fact that in my line of work, organizing people’s homes, I certainly can’t show up in heels, a dress, and jewelry. Although the desire is so strong I can talk myself into buying the items because I attend network meetings, don’t I? They require professional attire so it would be perfect for those meetings, even though I already have enough such attire sitting in my closet. How do we overcome the powerful force of advertising and beautiful displays in stores? Our best bet to overcome this temptation is to always have a plan, ie. list, and stick to it. Stores rely on your impulse shopping so they have set up displays of inexpensive items to hit you in the face as soon as you walk into the store or while standing in the check-out line whether you are in a grocery store or a store at the mall. Target has those $1-$5 dollar displays at the front door for a reason. How many times have you strolled through, “just to take a quick look” and had a basket full of items that only cost $1 or $3 and realized you had $25 dollars worth of stuff that you quite honestly don’t need or is cheaply made and won’t last. Even my pet store where I purchase my dog’s food does this! The strategy is that if the item is inexpensive, usually under $20 dollars, you will say to yourself, oh it’s only $5, $12, etc. I have absolutely succumbed to this myself and then I kick myself when I realize that the product was a waste of money. So have a plan for what you need at the store and do NOT browse. You need to keep your blinders on while you go from point A to point B to point C purchasing only what you went to the store to buy. Step away from the shiny object! If you see a shiny object that catches your eye, don’t touch it! Studies have shown that once you touch an item your brain begins to have feeling s of possession. Stop yourself and ask some important questions. Do I have something like this already? Does it have a practical purpose? Do I have a place to put it in my home? Will I really use it? How long will it last? Is it a trendy item that will be obsolete quickly? Don’t fall for the consumer manipulation by the companies selling this stuff. We have become an incredibly consumeristic society of cheap and disposable goods. The reason something is usually so inexpensive is that it is made cheaply and usually with the idea in mind that it will be useless quickly, therefore requiring another purchase again and again. Why not spend a bit more on quality items that will last and not end up in the landfill all too soon? Are you a conscious consumer? What is your strategy for avoiding the temptation of impulse buying? Share your strategy for being a concious shopper.